Nestled in the beautiful Adelaide Hills, you can find the wonderful Stirling Hotel. Perfect for fine or casual dining experiences, drinks with family or friends, or even a romantic getaway; The Stirling Hotel has it all. You can have an elite dining experience in the beautiful, cosy and luxurious Dining Room, which is situated in the original heritage hotel, or experience a more casual dining experience in the Bistro. The contemporary style gives off a warm vibe that spills out to a cool alfresco deck area, which is framed by the stunning leafy landscape of the Adelaide Hills. 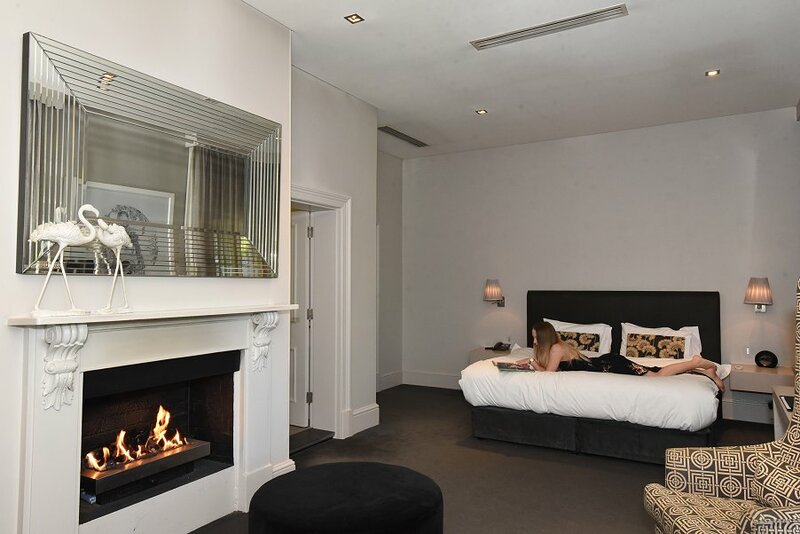 We were lucky enough to have the full experience of The Stirling Hotel, having a lovely dinner in the elegant dining room, a beautiful bistro breakfast and the perfect overnight accommodation in one of their five luxury rooms. For between $200-$300 per night (costs differ depending on dates), you can pick between the different rooms, each having their own unique style to suit any guests needs. We stayed in Room 3, which is rumoured to be a favourite among patrons, with classic French doors opening to a balustrade outdoor seating area overlooking Stirling’s main street. Indoors there is a stylish fireside setting to relax in as well as a super spacious bathroom offering a deluxe two-person bath, for those romantic nights. It was a beautiful room where we were able to relax and enjoy being in the picturesque hills region. We would gladly come back and stay again. All rooms also feature a king size bed, two flat screen televisions and a fully stocked mini bar. Food and Wine Manager, Wilson Shawyer, showed us wonderful hospitality throughout our visit and it was evident he took great pride in creating something special for any customer. “We are at the gateway to the hills, so want to showcase this as a hot spot location. The hills shouldn’t scare people as we are only twenty minutes from the city,” Shawyer said. Shawyer also only recently obtained his position at The Stirling Hotel but is already planning big things to come. “Within two months the renovations should be done and we will hopefully introduce a new dégustation menu,” Shawyer said. Assistant Venue Manager Richard Rogosic, was also lovely and inviting, and like Shawyer, was very proud of what had been happening at The Stirling Hotel; gushing about the new Botanical Gin bar. “I love this place, it’s a step away from everything, the shops, the markets, the city, and it’s always evolving and growing.” Rogosic said. “We want to educate visitors on the Gin’s we serve and give them a memorable experience, while making it so the customers feel they can approach us with any questions or queries they have,” he said. We toured through the Hotel before settling down for our meal. The Dining Room is open seven days a week for lunch or dinner. Located in the original heritage dining room of the Stirling Hotel, it offers a tranquil and relaxed environment with beautiful décor, from high ceilings to leafy features and warming open fires. 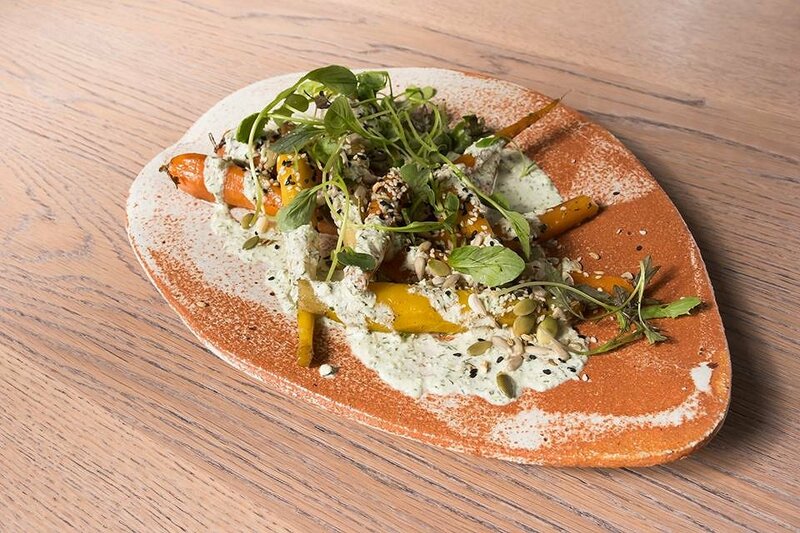 The Roasted Heirloom Carrots were served with a hot feta dressing, toasted seeds and dill. The carrots were cooked perfectly: lovely and soft, but still held its shape. The earthy flavours of the dill balanced well with the smooth and creamy feta dressing. The toasted seeds gave a lovely crunch to the dish, contrasting textures and added more depth of flavour. 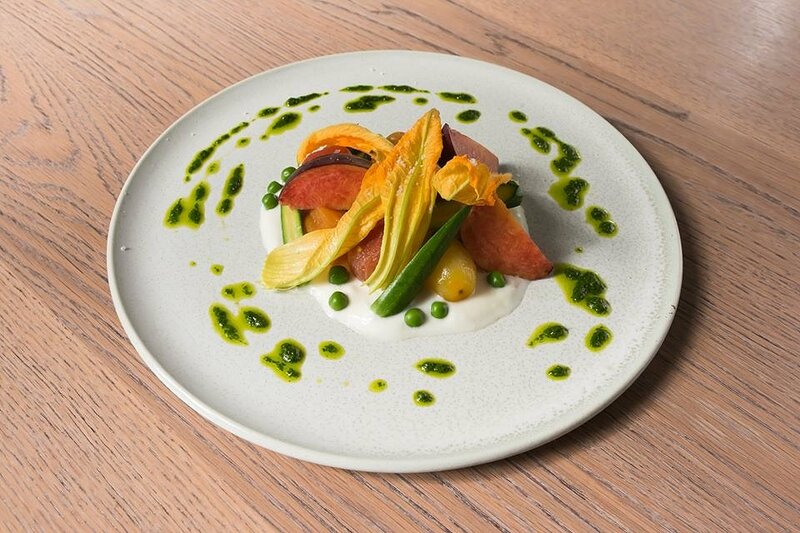 The Confit Heirloom Cherry Tomato entree was made with peach, peas, zucchini flower and sheep’s milk yoghurt. The soft sweet peach was an unusual combination with the cherry tomatoes but surprisingly worked. The sweetness balanced with the sharper sweet tang of the tomatoes and the creamy smoothness of the yoghurt, which was beautiful and light. The soft but crisp zucchini flower was light and fresh, a beautiful additive for presentation as well as to freshen the overall dish. The Burrata was a beautiful dish. Made with fresh figs, truffle honey, sun dried tomato pesto and charred sourdough. The sweet figs are always a lovely additive to any dish but paired with the smokiness of the grilled sourdough and the sweet earthy tone of the sun-dried tomatoes was a wonderful combination and balance of sweet and savoury flavours. The sourdough bread was stunning; I wish I could buy a loaf straight from the hotel! 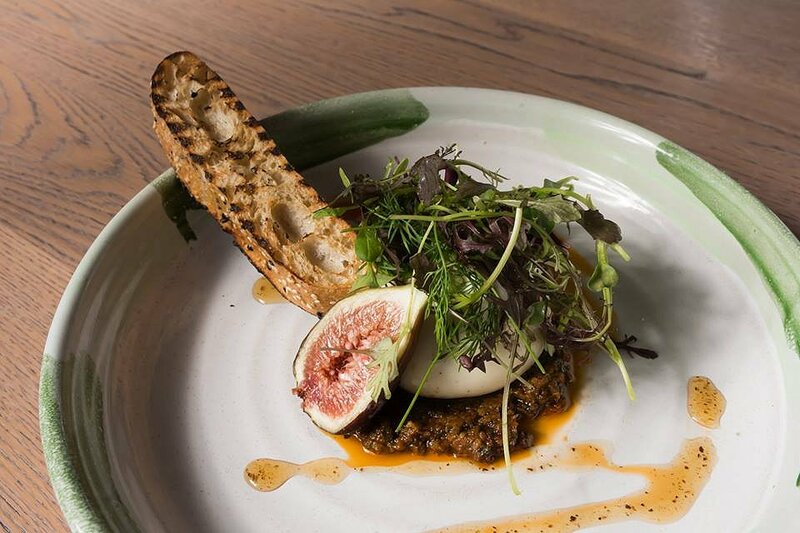 While the burrata cheese was soft and creamy and definitely the hero of the dish. If I could have the option to eat this dish everyday I would, it was that good, and we made sure to get every last bit off of the plate. 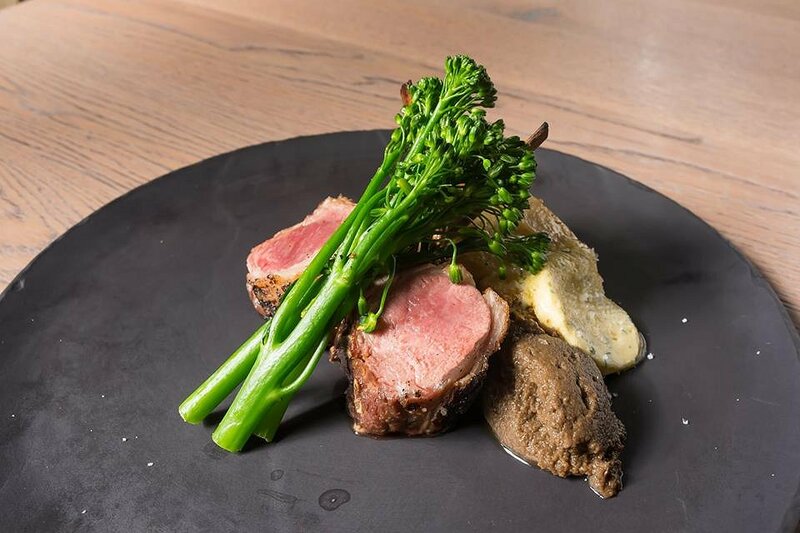 The Flueurieu Lamb Rack was served with potato, cauliflower and spek gratin, mushroom ketchup, broccolini and garlic rosemary butter. The Lamb rack was beautifully cooked, with a deep earthy savoury flavour. It was soft and tender with deep grilled smoky flavour on the skin. The mushroom ketchup had an almost barbecue sauce flavour but without the tang, which was deep and rich, and paired nicely with the deep meat flavours. The butter was smooth and creamy in texture but had a strong salty garlic flavour that balanced with the richer meat. The potato was cut thinly and was light, while the broccolini was crisp and fresh. The overall balance of flavours was wonderful and was another favourite of the night. 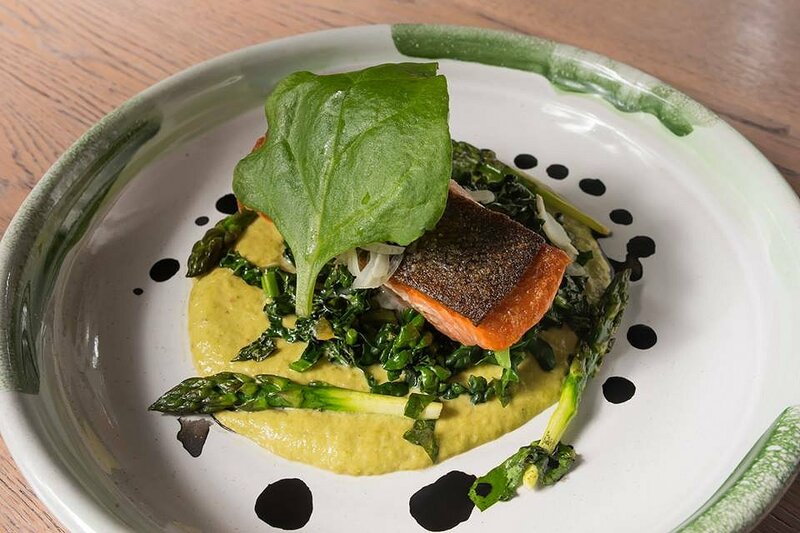 The Pan Fried New Zealand King Salmon was served with warrigal greens, asparagus, pickled fennel and squid ink oyster sauce. The salmon was beautiful, with lovely soft meat and a crispy skin to give crunch and a salty tang. The smokiness on the salmon was just right, not too overpowering and could still taste the freshness of the salmon underneath. The asparagus added a more savoury tone to the dish while also balancing the textures with its crisp crunch. The fennel was made into a purée, which was smooth and creamy while the cooked warrigal greens gave a deep earthy flavour that balanced the saltiness and added another fresh element to the dish. 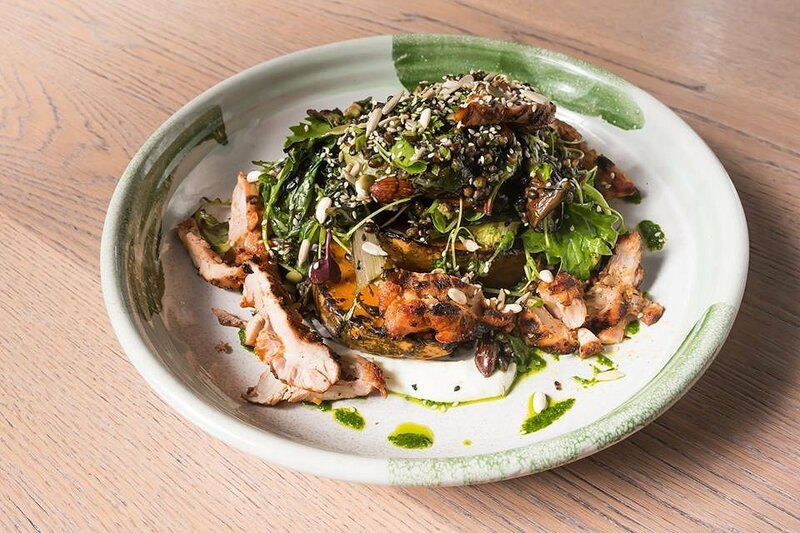 The Josper Roast Salad was made with pumpkin, silverbeet, eggplant, zucchini, black barley, puffed rice, toasted almonds, slasa verde, citrus yoghurt and we also opted to include grilled chicken. The lovely citrus yoghurt added a sour tang to the dish and helped balance the stronger smoky flavours of the pumpkin and grilled chicken. The chicken was cooked perfectly, and was beautifully tender. The greens were also cooked well and helped lighten the huge meal and from the richer savoury flavours. The texture change with the puffed rice and the black barley balanced well, while the smoked almonds helped tie the dish together and make it complete. The dish had plenty of deep smoky barbeque flavours and deeper rich earthy flavours that balanced well. For dessert, we had the Gin + Lemon Sorbet, which was made with thyme, cucumber, coral tuille and finger lime. This dish was basically a frozen gin cocktail and was delicious. The sweet gin sorbet was light and refreshing, which paired perfectly with the fresh crisp cucumber, which was sliced thinly and soaked up the lemon and gin flavours. 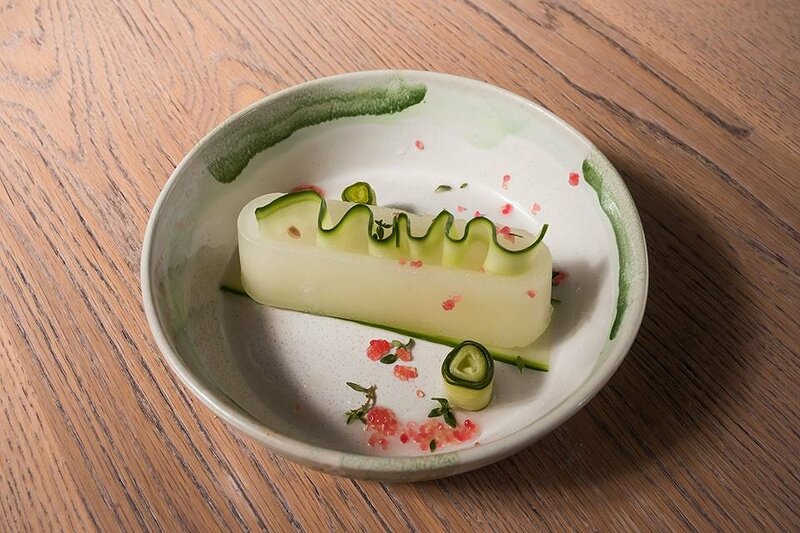 The cucumber also added a lovely texture balance with the crunchy vegetable and the soft icy sorbet. This dish would make a lovely end to your meal, or even a nice palette cleanser if you want an excuse to eat something sweet within your main course. 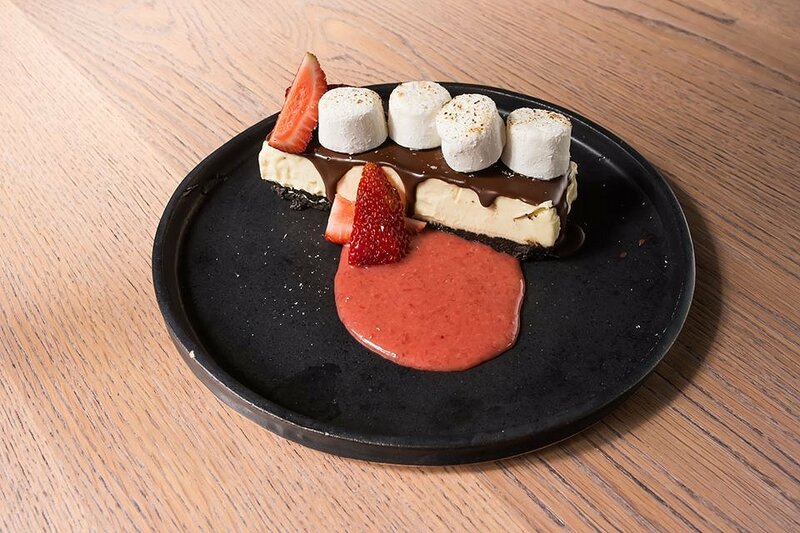 The White Chocolate + Oreo Cheesecake was presented with toasted marshmallows and a burnt strawberry caramel sauce. This meal was quite decadent. The caramel centre within the cheesecake was enough to make our mouths water and paired well with the thick cream cheese base, with the white chocolate adding sweetness. The strawberry caramel sauce had a lovely tart tang that balanced the sweet creamy cake. It was very filling but lovely and rich. 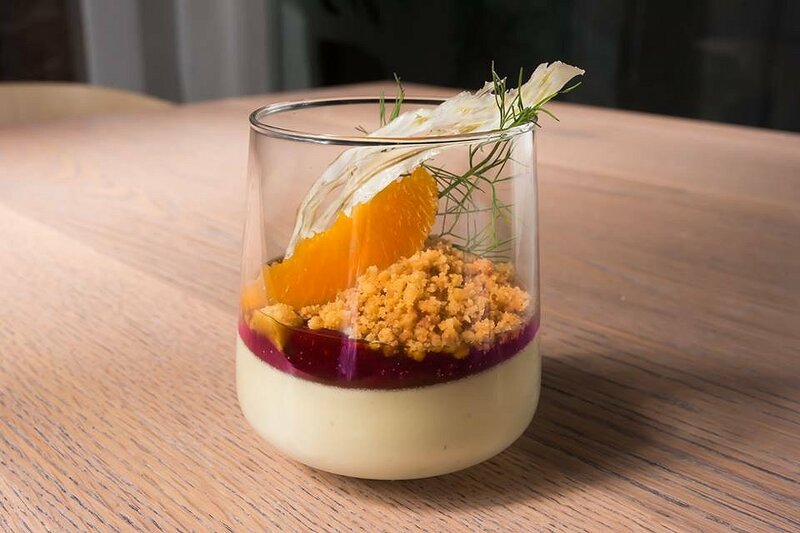 The Fennel + Orange Panna Cotta was served with a thick orange sauce and a fennel crumble. This was an unexpected dish as it was quite a savoury dessert. The zesty, tangy sauce was thick and very strong in taste, almost like a jam, much similar to marmalade in taste and texture. This paired well with the smooth and light panna cotta, which lightened the dish and added sweetness. The fennel crumble also added an earthy flavour and gave a lovely texture change to the otherwise smooth dish. The added orange wedge gave off a different layer of sweetness than the orange sauce, which completed the dish. The dinner meals were wonderful, all beautifully presented and full of flavour. As we walked back to our room with full bellies, we couldn’t wait for breakfast the next morning. The Bistro offers a unique and exciting dinning and drinking experience. With bars and multiple dining areas, the Bistro offers plenty of perfect spaces to get together with family and friends. 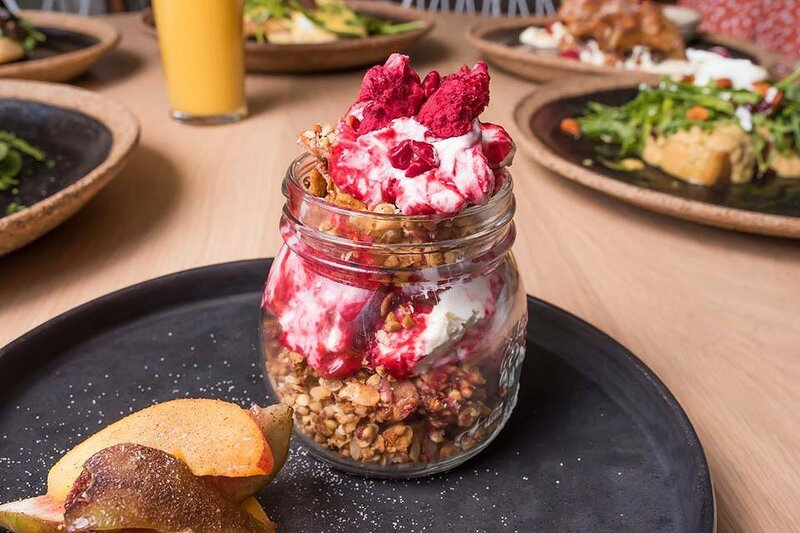 The Yoghurt + Granola Pot, were served with peach, fig and crispy raspberry. A healthy summer breakfast at it’s finest. There were generous amounts of tart raspberries, which were mixed into a smooth, thick and creamy yoghurt. The granola was crunchy and chewy which added a lovely textural contrast to the dish. The Belgian Waffles came with toffee banana, whipped cream, blueberries and maple syrup. Even reading this dish on the menu made my mouth water and my love for sweet dishes spike. 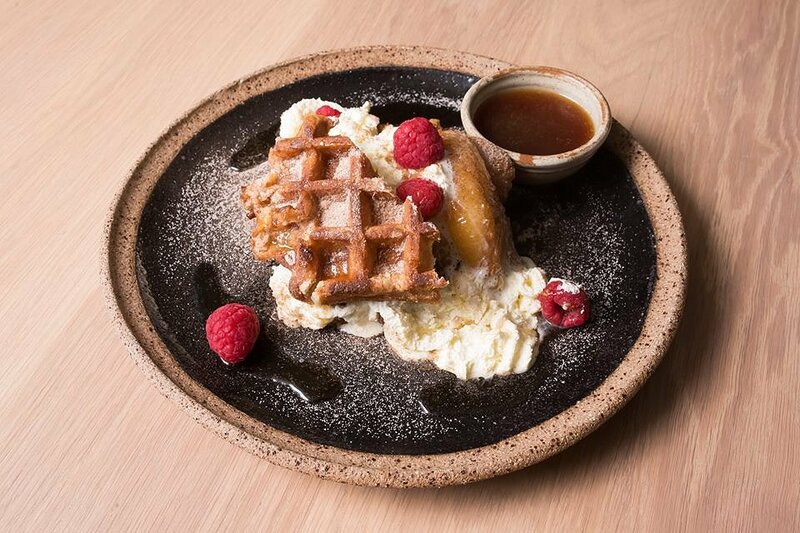 The waffles were crunchy and authentic, complete with pearl sugar within the beautifully cooked batter. The toffee banana had a artificial sweetness wrapped around natural sweetness, the toffee and banana balancing perfectly. The blueberries gave a lovely tarty tang to balance the other sweeter flavours; overall, the different components combined well together to create a decadent breakfast/dessert. 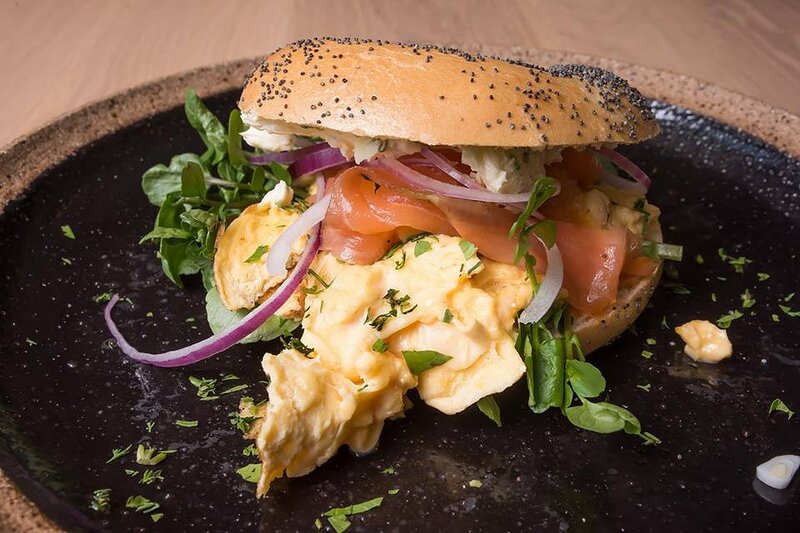 The Breakfast Bagel was a wonderful and fresh breakfast dish. You can’t really go wrong with the tried and true combination of smoked salmon, spanish onion and crème fraiche. But adding extra protein from the scrambled eggs and the fresh crispness of the watercress, you are on to a winner. 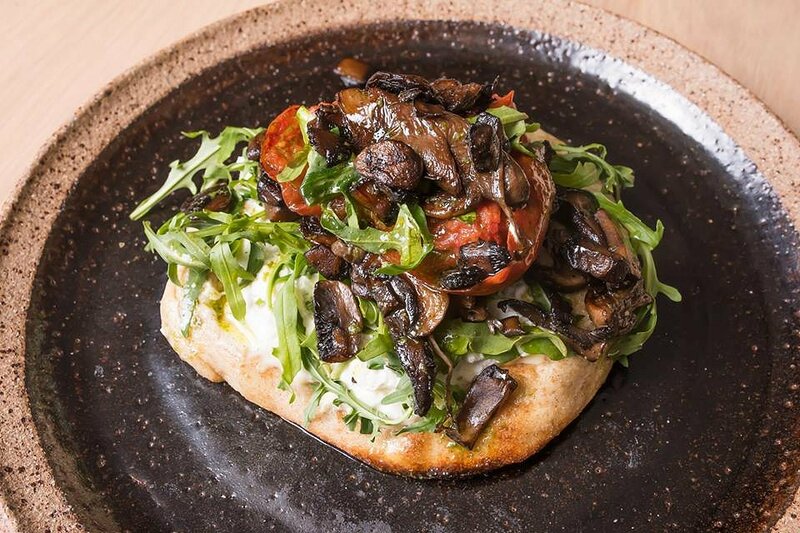 The Roast Mushroom Pizza was also topped with herbed goats curd, roast tomato and rocket. It is not what you first expect when you think of pizza, especially just having one at breakfast time, but all the elements were there. There was a generous amount of creamy goats curd, tart roast tomatoes and crispy rocket on a thick pizza base. All elements worked well together and overall it was fresh and light. The Avocado + Labneh was a pleasant surprise. 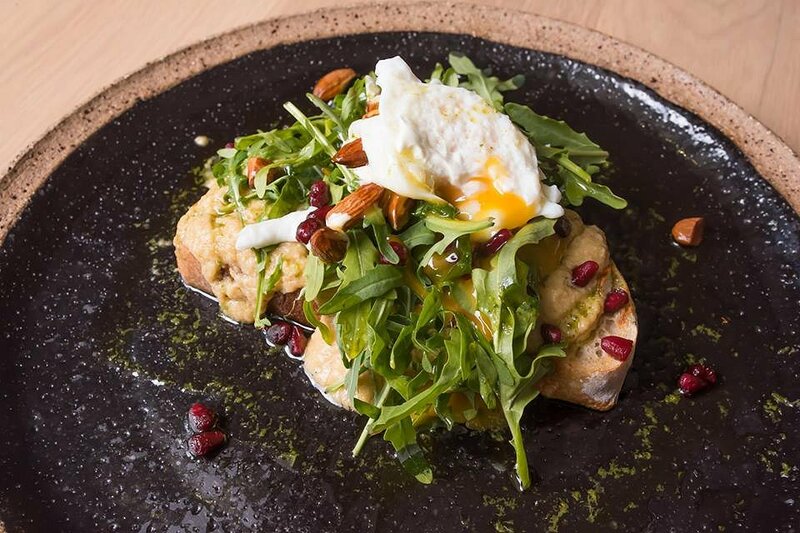 Served with hummus, soft-boiled egg, pomegranate, smoked almonds and sourdough, it was clearly a dish of Middle Eastern influence. The smooth and creamy hummus was earthy in taste and definitely the star of the dish. Mixed with the crunchy almonds, which gave off a lovely deep smoky flavour and the sweet pomegranate seeds, this dish was well balanced with textures and flavours, overall and amazing dish! The bistro area also offers live entertainment on Friday and Saturday nights from 7:30pm and Sunday sessions from 2:30pm. The Stirling Hotel was overall a fantastic experience. Nestled in a beautiful location with excellent service and wonderful food; what more can you ask for? And with exciting new things still on they way, there will be plenty of different experiences for guests. And if you are feeling up to it, why not stay the night after dinner and enjoy their wonderful breakfast menu as well, like we did? There are so many different areas within the hotel for any occasion; to relax and chill, have a party with friends and family, or getting the elite dining experience at half the price. Only twenty minutes from Adelaide’s CBD, it only takes a short drive up the freeway to discover a beautiful piece of paradise that is The Stirling Hotel.